USTA Eastern and the Junior Tennis Foundation (JTF) inducted four extraordinary new members into the Eastern Hall of Fame Class of 2018 on Saturday, April 28, at the historic New York Athletic Club in Manhattan. 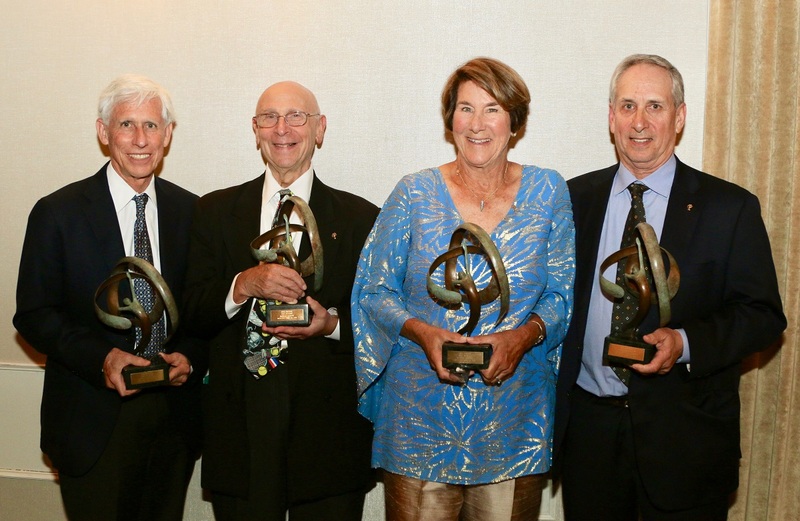 Eastern legends David Benjamin, Lloyd Emanuel, Robert Kenas and Nadine Netter Levy were celebrated for their outstanding lifetime achievements and contributions to the game, and their legacies will now be enshrined in Eastern tennis history. The USTA Eastern Tennis Hall of Fame exists to recognize those tennis players and non-players in the Eastern section whose achievements as sportsmen or sportswomen or whose contributions to tennis are worthy of the highest commendation and recognition. More than 125 guests, including USTA Eastern Board members, past Hall of Fame inductees and friends and family of the incoming class, were in attendance for the 31st annual celebration. Proceeds from the celebration will benefit JTF, which provides scholarships and grants for junior and adaptive tennis players throughout the Eastern Section. At the event, two junior players, Christopher Perez Santiago and Nicole Massa, are receiving the David N. Dinkins Scholarship Awards for their accomplishments both athletically and academically. David A. Benjamin, Skillman, NJ, presented by Bob Ingersole, JTF President With his 26-year tenure as Princeton University’s Varsity Men’s Tennis Coach and four decades leading the Intercollegiate Tennis Association (ITA), Benjamin has been a guiding force and shaper of today’s world of collegiate tennis. Lloyd Emanuel, Rye, NY, presented by Bob Litwin, 18-time US National Champion and 8-time member of the US Senior Davis Cup A former varsity captain of Columbia University Men’s Tennis Team, Emanuel founded the Eastern Masters Grand Prix Circuit, establishing a thriving forum for adult players to continue competing at the highest levels. During his 40 years volunteering in the section, Emanuel served on the USTA Eastern Board of Trustees and built the foundation for the ranking system that we continue to use today. Robert Kenas, Marlboro, NJ, presented by his children, Jennifer Kenas Arianas and David Kenas, Kenas’s beautiful photography chronicled the Eastern Tennis Association junior circuit and section special events in the 80’s and 90’s. His pictures have been featured in national tennis publications including Tennis Week and World Tennis, as well as national newspapers like the New York Times and serve as the gold standard for other section photographers to follow. Nadine Netter Levy, Palm Beach, FL, presented by her children, Sharon Kalb, Gus Levy, Kate Levy, Vanessa Seide Born in New York City and raised in Scarsdale, New York, Netter is a former tour player and co-captain of USTA Eastern’s Addie Cup.